"Words are weapons!" TIFF has dropped a trailer for a film premiering at the fest this fall in the Midnight category. 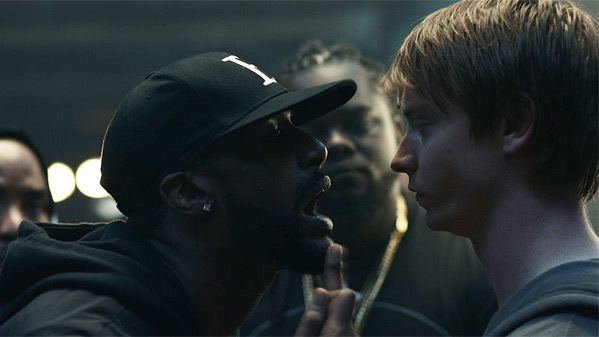 Titled Bodied, from director Joseph Kahn, the film is about a white graduate student who gets deep into the battle rap world to write his thesis. He ends up discovering he has a competitive obsession with battle rap. This seems like it might be a perfect double feature with Patti Cake$ also from this year. Calum Worthy stars as Adam, with a cast including Anthony Michael Hall, Debra Wilson, Ryan Ochoa, Daffany McGaray Clark, Charlamagne tha God, Loaded Lux, Dizaster, Dumbfoundead, and Hollow Da Don. This film is produced by Eminem, with a script co-written by Toronto rapper Alex Larsen (aka Kid Twist). This trailer is hilarious, and it grabbed my attention, I'm so down for this. Bring it. A progressive graduate student finds success and sparks outrage when his interest in battle rap as a thesis subject becomes a competitive obsession. Bodied is directed by Korean American filmmaker Joseph Kahn (follow him on Twitter @@JosephKahn), director of the film Detention and the Power Rangers short film, as well as director of many music videos for many years. The screenplay is written by Joseph Kahn and Alex Larsen. This is set to premiere at the Toronto Film Festival this fall in the Midnight category. The film is currently still seeking a distributor, so no other release info is available yet. Stay tuned for more. Who's in?